They are the only certified gateway to have seamless connectivity for settlement into every New Zealand Bank, most major banks in Australia, and selected banks in the UK, USA, Singapore and the Pacific Islands. They have a long-standing relationship with Zeald as a premium partner, which means clients can enjoy high levels of service and plans that could suit their needs at favourable rates. They are very easy to setup. To view our pricing plans, click here. Once you have purchased a Payment Express plan, you will receive a confirmation email with instructions on how you can get started. It’s basically step 3 and 4 below. Setup an online merchant bank account for processing card transactions. This will be done directly with your bank. Refer to the Payment Express information about merchant accounts. NOTE: You will need to specify to your bank that your Merchant Account is required to receive Internet Credit Card payments. If you want to accept transactions in currencies other than New Zealand Dollars, please note that not all banks have this facility. The BNZ ‘Buyline’ service is one account type that accepts non-New Zealand Dollar transactions. Learn more about merchant accounts. 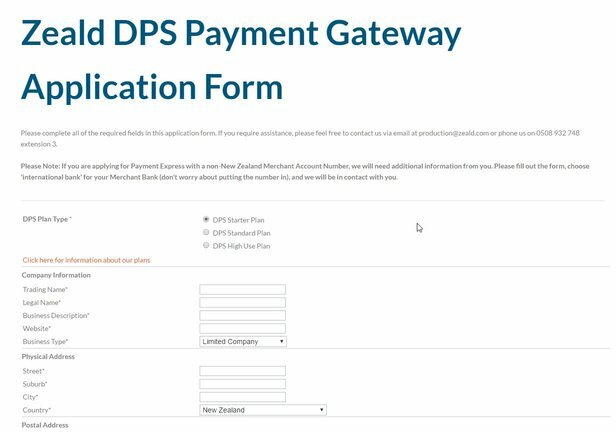 You can find the link to the Zeald DPS Application form on the email you will receive after purchasing a Payment Express Plan. You will need your merchant number, which will be provided to you by your bank. Zeald will complete the application process and set up Credit Card processing on your website. Once you have completed and submitted the online form, we will process your application. Please note that this process will take approximately 5 to 7 working days, as we will need to liaise with Payment Express. Once the application has been processed, Payment Express will send through integration details and we will set up and test the credit card processing on your website. IMPORTANT NOTE: If you have switched banks, or have an updated bank account, make sure you update the preference settings and to advise DPS on the changes. DPS will provide you with a new ID or key, which you need to relay to our support team for updating.